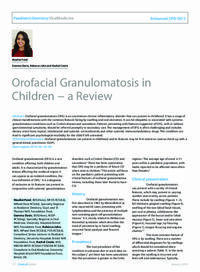 Abstract: Orofacial granulomatosis (OFG) is an uncommon chronic inflammatory disorder that can present in childhood. It has a range of clinical manifestations with the common features being lip swelling and oral ulceration. It can be idiopathic or associated with systemic granulomatous conditions such as Crohn’s disease and sarcoidosis. Patients presenting with features suggestive of OFG, with or without gastrointestinal symptoms, should be referred promptly to secondary care. The management of OFG is often challenging and includes dietary restrictions; topical, intralesional and systemic corticosteroids; and other systemic immunomodulatory drugs. This condition can lead to significant psychological morbidity for the child if left untreated. Clinical relevance: Orofacial granulomatosis can present in childhood and its features may be first noted on routine check-up with a general dental practitioner (GDP). Author notes: Maalini Patel, BDS(Hons), MFDS RCS(Ed), MPaed Dent RCS(Ed), Specialty Registrar in Paediatric Dentistry, Guy’s and St Thomas’ NHS Foundation Trust, Gemma Davis, BDS(Hons), MJDF RCS(Eng), Specialty Registrar in Oral Medicine, University Hospitals Bristol NHS Foundation Trust, Rebecca John, BDS, MPaed Dent RCS(Ed), FDS RCS(Ed), Consultant Senior Lecturer in Paediatric Dentistry, University Hospitals Bristol NHS Foundation Trust, Rachel Cowie, BDS, MBChB MFDS RCS(Ed) FDS(OM) RCS(Ed), Consultant in Oral Medicine, University Hospitals Bristol NHS Foundation Trust, Bristol, UK. Objective: To understand the presenting features of orofacial granulomatosis and be able to refer appropriately.